Click on images to display in Lightbox; this will also make captions easier to read. Moe and Michelle are musicians, videographers, and more. Jamie is originally from Queensland, Australia, but holds American as well as Australian citizenship. He can conduct a chorus, do a solo gig with a guitar for a bunch of drunks in a bar, play the piano, play folk, rock and classical guitar, and I don't know what all else. He also paints. Jason had recently finished this when this image was taken. Allyson is having a great time. The dog is afraid of strobe lights and is about to leave the frame. In her salad days Lillian was an opera singer in Germany, with a company I cannot for the life of me spell or pronounce, for which I apologize. Meg: What you can't tell from the image is her excellent personality and the fact that she's probably the smartest person in the room, and definitely the best cook. Late in the summer of 2014 I walked into a Virginia art gallery that was hosting a one man photographic exhibit. The photographer was a guy named Walter Martinez. I got to talking with him, and told him I'd like to shoot his portrait. He agreed, and we did the shoot in my studio a couple days later. Walter liked the results, and used the this portrait on his social media. A year later he was dead. He was a good man with a sense of humor, a collector of antique cameras, and a more than decent photographer. Stamford ( left) and Roman (right) are Richmond, VA dogs. When this image was taken, one of their owners was making a fool of herself in order to get the dogs to look interested, and obviously It worked. In photographing dog portraits, it helps tremendously if the dogs know the "stay" command, as these two clearly do. Still, the photographer has to be quick --- there are limits. 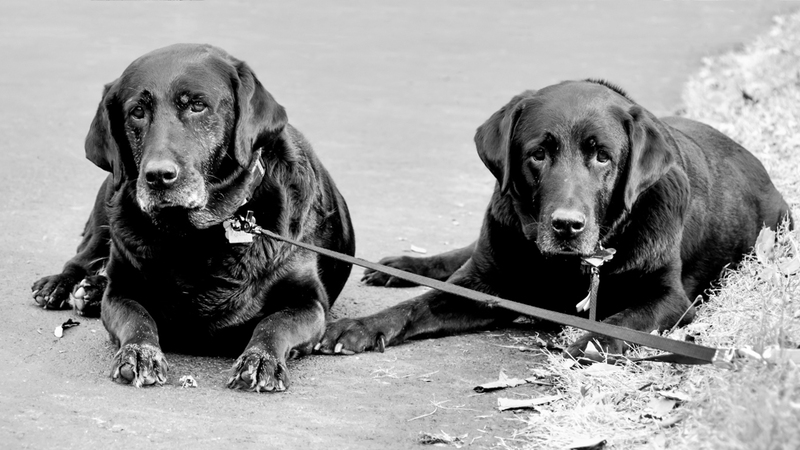 Gunner (right) and his sister, Ebony: These were wonderful dogs, gifted comedians, and steadfast companions. We miss them.